It's not easy to find comfortable places to stay elsewhere in the solar system. However, Geoffrey Landis, a scientist at NASA's Glenn Research Center, suggests that Venus might be a good place to look. I know what you're thinking. Venus? Surface temperature of 490 degrees centigrade with about 92 times the atmospheric pressure of Earth's surface? Doesn't sound very hospitable. However, Landis, a science fiction writer in his spare time, suggests that we think a bit outside the box. In a recent interview, he suggested building a city in the clouds about fifty kilometers above the surface. At that altitude, the atmosphere of Venus is at it's most Earth-like. The atmosphere has an air pressure of about one bar and the temperature ranges in the 0-50 degrees centigrade range. You'd need breathing apparatus, but probably not a space suit. Landis adds that a city might not be as difficult to build - and to keep afloat - as you might think. "Because the atmosphere of Venus is CO2, the gases that we live in all the time, nitrogen and oxygen, would be a lifting gas," Landis said. "On Earth, we know to get something to lift, you need something lighter than air. Well, on Venus, guess what? Our air is lighter than air, or at least lighter than the Venus atmosphere." "If you could just take the room you're sitting in and replace the walls with something thinner, the room would float on Venus," he remarked. SF fans are no doubt hoping that Lando Calrissian will be available to act as administrator; as long as you're building Cloud City, you might as well do it right. Update 18-Dec-2016: Take a look at this early reference to the idea of cities floating in the atmosphere of Venus in Fritz Leiber's humorous 1958 short story Bread Overhead!. End update. 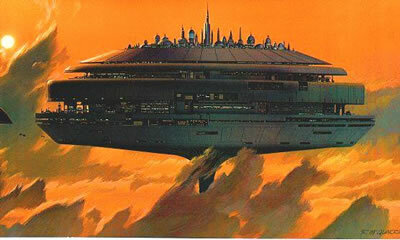 From Colonizing Venus with floating cities.